Community is fickle, hard to put your finger on, but vital. To people like Erin and I, who've started afresh in a new country twice in the last two years, it's something we actively need to think about in a way that our more stable friends don't. Everyone needs to carve out space in their life for others, but after you've been in the same place for years the idea of establishing traditions and meeting people is something is so so engrained in that's it's hard to examine it separately from everyday life. If one is lucky it just happens organically. Being the new kid on the block is not a new thing for either of us. I changed school districts five times growing up, and moved to a new city for college during which I studied abroad four times. After school I ended up living and working in three different states and as many countries each time with a new beginning. As someone who has a natural tendency to withdraw, I've had varying levels of success in finding the community I crave. I actually enjoy having a lot of time to myself, and have had many pleasant friday nights with the companionship of only a glass of wine and a good book. However, when the days add into weeks, and then months, without meaningfully connecting with another person it creates a subtly growing depression. Finding Erin, my partner in crime, helps a lot. A community of two is a wonderful gift, and it has been on the strength of that that we've both been able to grow. Upon getting to Tanzania we, for the first time in our adult lives, gave up having our own personal space. Erin and I moved into a single room in an apartment with much younger strangers in a small town in an exotic land. I'll never regret it, but sometimes we called it the 'pressure cooker,' because any small disagreement stewed because there was nowhere to go to cool off and get perspective. Even taking a long walk wasn't an option after dark when the small threat of crime, and the bigger threat of wild dogs kept us inside. The only solution was the same as when I sat in my lonely little studio apartment having just moved to Massachusetts: finding a broader community. That's harder than it sounds, to say the least. Fortunately, my father unwittingly taught me a lesson early in life that's served me well. He too craves community, but with a stubborn proactivity that few share. Shortly after moving our family to NY he wished he had some good friends that he could discuss books with. So, he declared it. He got permission from a local church to have a morning 'philosophy group' every Sunday and thereafter every week he dutifully went and made a pot of coffee. He once let me know that it wasn't that easy, and there were many weeks early on where he was the only person there. But, as Woody Allen once said '80% of anything is showing up,' so he ignored the lonely mornings and just kept at it. Today that dynamic discussion group has been around for decades, outlasting him when he moved so far away he can't make it anymore. But he hasn't stopped there, he brought the same stubbornness to his passion for playing music with people which has evolved over the years into a constantly changing kaleidoscope of bands, events, and now a regular folk music class at a local library. Although a remarkable person, he isn't a professor of philosophy or an acclaimed musical prodigy that draws people in through his star power. He does it by simply giving peoples need for community something to crystalize around. Most humans crave community, and despite the economic boom in 'social media' it is something western society is not very good at meaningfully providing. Most people don't recognize it, or know what to do about it, even as they suffer measurably from it's lack. Obviously there are many worthwhile communities that do make the difference in many lives, but almost always their origin can be traced to a single person that willed it into being. For it to be a success it must grow beyond it's founder to embrace the dynamic nature of it's members to a point where the founding is really just a small blip in it's history. 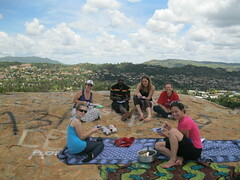 When Erin and moved to Iringa we had some great luck. The three strangers we moved in with quickly became dear friends, and the small school Erin worked at had long been the hub of tight nit local community. Our household wanted to do our part, so we declared our apartment the party house for faculty and friends. We spent long happy hours preparing meals, procuring drinks, and begging people to come. There were game nights, 'movie nights' done a laptop, and an American Thanksgiving (starring a couple small chickens, because turkey is hard to find). A lot of people worked hard at the community and far more than our amazing wildlife safaris this made our time in Tanzania wonderful. And then we moved north, to Nairobi Kenya and needed to start again. We ended up in a neat little group called sports for change, which organizes outdoor activities in return for a small donation to a worth cause and started on a hike in the spectacular Mesengai crater. Jumping forward a few months, moved to a smaller, and far less convenient, house because the new house was on a compound shared with a couple people we met on that hike. We were lured to the outskirts of the vibrant city of Nairobi by the possibility of living in something more akin to cohousing. Although it's taken some adjustment we love the gardens around the house, the bird filled trees, and reprieve from the crazy city. 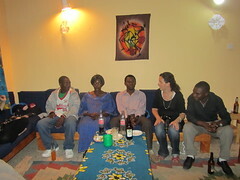 We really like the people from neighboring houses, a motley crew from five different countries, but within a few weeks started missing the community that we'd moved here for because everyone was busy with their own lives. So, Erin and I declared a weekly gathering. Erin has long had the same philosophy on community as my father, with the added invaluable skill of being a very clever cook. So, we invited whichever of our neighbors over for dinner and drinks one Monday. Most couldn't make it, but some did, and by the end of the evening we let it be known that something like it was going to be a weekly tradition. A lot more people showed up for the next one, this last week. And by the end of the evening a couple people let it be known that next week the gathering should be at their place.